This sign sits in my garage in West Seattle, a gift I don’t quite know what to do with. 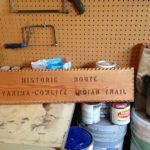 It was given to me by the folks at the White Pass Country Museum in Packwood, Washington, when I was researching the Yakama-Cowlitz Trail. I suspect one reason it was “surplus” was the spelling of the name Yakima–which is the spelling for the city but not for the people. It was also a nudge–finish that article on the trail! So I did. This summer’s issue of Columbia, published by the Washington State Historical Society, features my article on the Yakama-Cowlitz Trail to Cowlitz Pass, a trail taken for thousands of years by people from both sides of the Cascade Mountains. Cowlitz Pass stands just southeast of Mount Rainier, on the Pacific Crest Trail. During the winters some Yakama people lived in the Tieton and Naches River valleys on the east side of the Cascade Crest. The Cowlitz lived in the Big Bottom of the Cowlitz River on the west. In the summer months, the Yakama came up what is now Indian Creek from the east side; the Upper Cowlitz or Taytnapam came up Summit Creek from the west side. They hunted deer and mountain goats, gathered huckleberries, and socialized. Gradually, through intermarriage, the Taytnapam acquired some characteristics of the Yakama, in language and dress. In years after American settlement, they continued to cross the pass to visit relatives. I found out about this trail through the writings of archaeologist David Rice, the work of Gifford Pinchot anthropologist Rick McClure, and the advocacy of Ray Paolella for the William O. Douglas Heritage Trail. As a youth, Douglas hiked up to Cowlitz Pass and spent time with the sheepherders there. 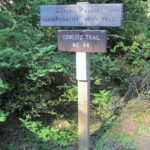 Efforts are afoot to map some 23 miles of this historic trail. The last four miles from the west are Forest Service trail #44 which begins from the Soda Springs campground where the real sign is posted. 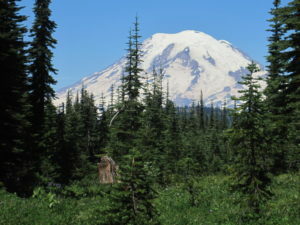 It’s a wonderful day hike or backpack, but beware of mosquitoes until late summer.